I wear contacts. Without them, my vision is blurry. I am nearsighted with astigmatism. Due to the move, Peter’s job change, and waiting on insurance, my last pair of lenses were getting a rather thick film on them. One or both may have had other imperfections as well, like small chips or a hole. I went to the eye doctor this week. For several years, my vision has remained fairly consistent and my eyes have the same prescription (which means I can purchase one box of lenses at a time). My astigmatism does increase every few years, and now my brand of contacts makes a higher prescription, so I don’t have to change brands. I’m wearing my new trial lenses. My vision is crystal clear. The lenses are free of haze and blemish. They are perfect, just as they perfect my vision. 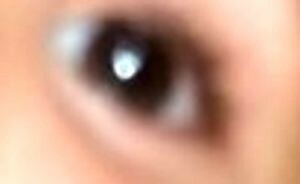 Dietrich took this selfie of his eye when he was two years old. Many times, things in this world cloud our vision. Sin creates a haze, distorting the Truth. Satan chips away at what is perfect, altering God’s Word ever so slightly. Unlike old contact lenses, this misleading worldview is often more comfortable for people. It fits better into their lifestyle. Like those old those lenses, eventually the murky film will cause pain and even death. Consider throwing out the tattered lenses and exchange the distorted version for the complete Truth. Your eyes will thank you and the reward is Eternal. This post may be linked up at other amazing places online. This world is sadly loosing its vision. It seems that everytime we turn around, a heavier film is being placed on our world. Our society, our World, is so worried about “fitting in” that people are loosing sight of what is important, God. Following Gods word is the only thing that, in the end, will allow you to “fit into” Heaven. Without him, you are blind…..
What a great analogy – especially as I sit here with my own pair of too-old contacts waiting for my appointment next month! Ugh! It’s awful to wait that long for an appointment with lenses in dire shape. Hoping your spiritual lenses are in a much healthier state! Love new lenses and looove clear vision. What a great analogy and reminder! I once was blind but now I see! See, I didn’t even THINK of that! That’s why we need our bloggy friends and comments! I love how you related this to your vision! I did a post last year after having Lasik on having new spiritual eyes in the Lord! It’s so true how twisted satan can make things and how sin distorts our vision! Thanks for this truth! I will have to go look for that post. Glad you stopped by and gained encouragement! This is a great analogy and good reminder. Sin can indeed skew view the ways we view things in life. Good to keep in mind an watch out for with the help of the Holy Spirit! Jonathan Key recently posted…The No Spend Challenge – Day 24: Have Another Free Date Night! Great point! I do not intentionally or specifically leave the Holy Spirit out when I talk about being guided to Truth or Wisdom. I need the reminder that God sent us a helper at the point of our salvation to aid us against the devil’s schemes. Thank you for stopping by! Really great use of an analogy! Keep on encouraging! Analogies and encouragement are kind of my thing. Glad you stopped by and enjoyed it! I’ve been wearing glasses since I was in 2nd grade with many changes to strength. And as with my spiritual glasses. We tend to let things get cloudy and we fill up with darkness. But what a Heavenly Father — willing to clear things up. We ask, He answers. This was so encouraging to read. Pamela recently posted…Is Your Child a Bully? I am glad you found encouragement here today and were able to relate to my tragic lens condition anecdote. I, too, am so thankful that our Father hears our prayers and answers according to our needs. I have found myself being tempted into thinking things I knew were wrong, were not wrong at all. But if we are reading God’s word and seeking His wisdom, we can’t be fooled! Thanks for the encouragement! Being duped into believed the lies are truth is one of Satan’s oldest tricks – but it certainly seems more prevalent these days. It has everything to do with where we seek our wisdom. God’s Word is absolute. I’m glad you were encouraged and thank you for the comment. It is so easy to let the “haze” of daily life get in the way of what the Bible really tells us. Thank you for the reminder that we should seek out clear wisdom. You are welcome. The Bible is the only Path to true wisdom. Glad you were encouraged. This is so right! We can get “clouded” so easily in this technological world. Oh, even without technology, the distraction of the world is endless. Great perspective!! Yes sin ALWAYS skews our view and the way we see things. Great post! Love the illustration and application! Very nicely worded post. Love the picture of your son! Great analogy! I’ve been meaning to write out this comparison for years. With this past month being the worst shape my contacts have ever been in when I finally went to the eye doctor, I knew I had to write it. That picture took me several minutes of “digging” in my archives to find.